1. Snug Harbour to Franklin Island. 3. Franklin Island to Snug Harbour. 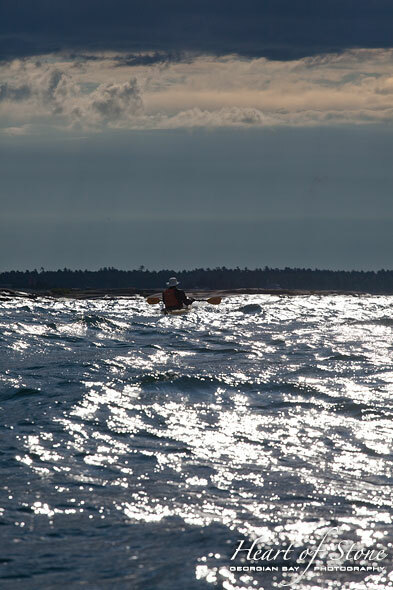 There are a few classic Georgian Bay trips, and a lot of paddlers would count Franklin Island as their first. It’s the perfect first ‘real’ kayak adventure: an easy 5K or so gets you from the put-in to great campsites, the western side of the island is 100% cottage free, and the wildlife and rock formations are some of the best of the Bay. 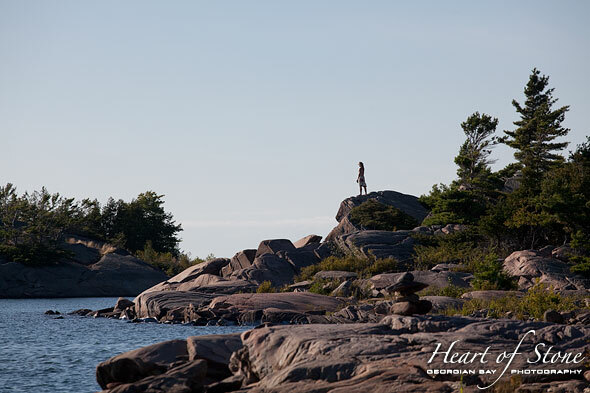 It’s a wonderful short-duration destination, and perfect for that first taste of pure Georgian Bay. Access is from Snug Harbour, where there are two parking lots: one for residents, and a free public parking lot. The public lot is not large, and Franklin is a popular destination, so often the parking lot is full. If it is, don’t double-park someone in, and don’t park in the resident’s lot. People who are double-parking are large groups who all expect to return together, so they can get their cars out. If the public lot is full, you’ll have to pay to park at the marina. Again, this is a very popular destination, don’t ruin it for other paddlers by aggravating the locals. Out from the public dock at Snug, the first destination is the Snug Harbour lighthouse. Built in 1894, this beautiful structure still shines out over the waters of Georgian Bay, although it’s been completely automated. Snug has a sister light, on Jones Island, south of Parry Sound. The lighthouse is closed to visitors, but makes a wonderful scenic backdrop as you begin your adventure. 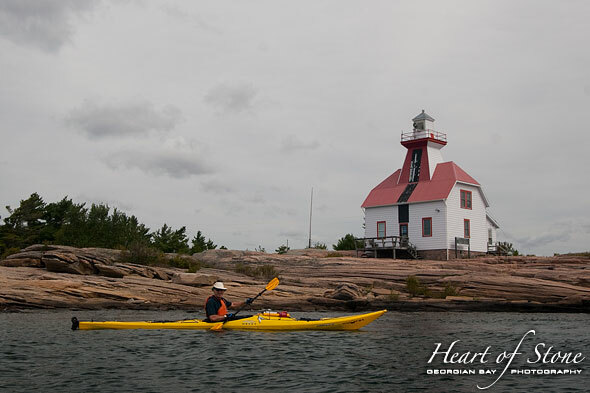 Above, from left to right: paddling past the Snug Harbour lighthouse, and a first taste of life on the Big Water. The first landfall on Franklin is Phoebe Point, a nice campsite in itself with some lovely rock formations. If the wind is from the north, there’s just enough fetch in this part of the Shebeshekong Channel to build waves to a level that can give beginners pause. It’s a short enough paddle, but if you’re new at this your first ‘open water crossing’ can be heart-stopping. Franklin Island has two very different personalities. The west shore is very rocky, wild, and remote, with no cottages. The east shore features more sloping landscapes, and is much more protected from the prevailing westerly winds coming in off the Bay, but there are a lot of cottages across the channel. Check the weather forecast closely, winds can easily prevent you from leaving your campsite on the western shore for days at a time. 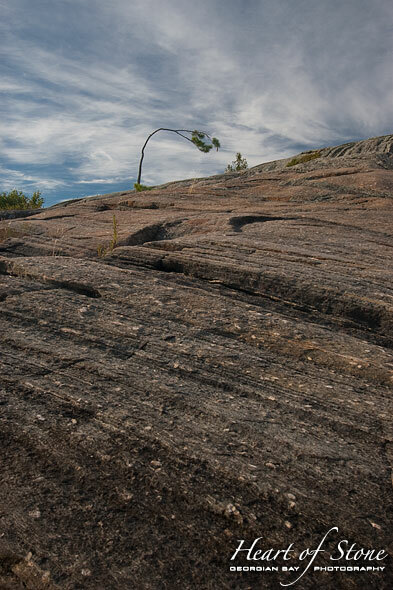 I was windbound on Franklin for three days in 2010, winds can very quickly reach expert levels and above. Know your weather before you go. 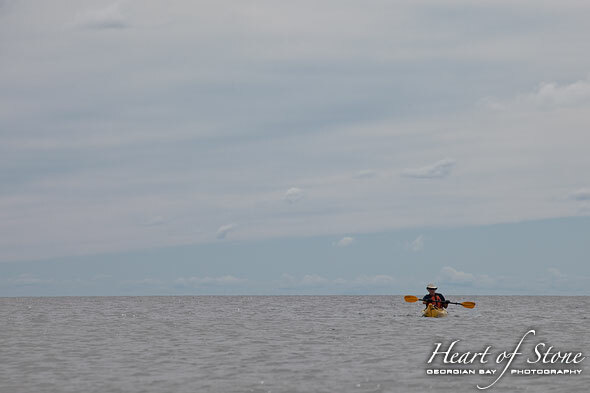 Rounding the southern tip of Franklin, we began our paddle up the western shore. 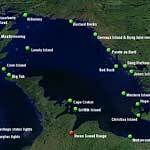 There are a lot of islands and protected lagoons, which can help in the event of a strong westerly. But if the waves are strong enough, they can create funnel points where waves can build upon themselves and make passage impossible (or fun, depending on your skill level). We timed our trip very specifically, to paddle into Franklin on a Sunday and leave on a Tuesday. Being one of the most popular kayaking destinations in the bay, the crowds today didn’t disappoint. Group upon group of 4 to 10 paddlers, both singles and tandems, rowboats and canoes, were paddling out or packing up to begin their trip out. Dock space at Snug was about to be at a premium. Clockwise from top: a rare sandy beach in Georgian Bay, latrine trail marker, thunder box, red rock lighthouse, and rock formations all on the western shore of Franklin Island. 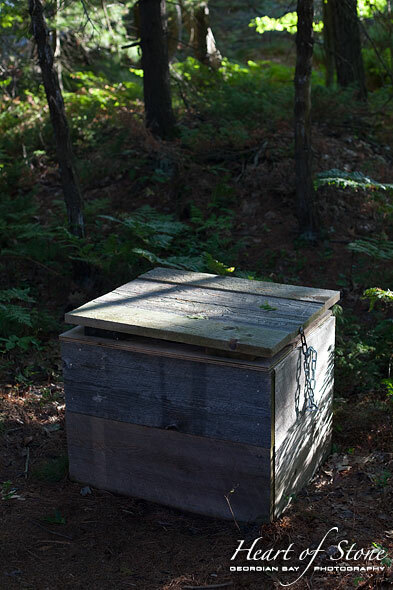 Franklin Island is crown land, but a group of organizations, including White Squall, tries to maintain them by providing thunder boxes (luxuries in the wilderness!) and cleaning up after inconsiderate campers. Do you part and pack out what you pack in. From Franklin Island, there are any number of trip possibilities. 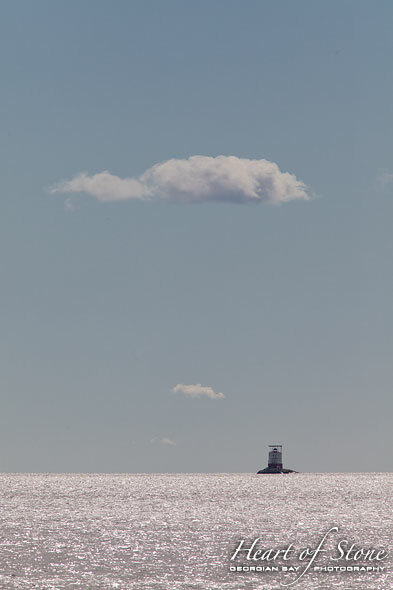 From the western shore you can clearly see the Red Rock lighthouse, the entire Mink island chain, and the McCoy Islands on the northwest horizon. We chose the old Franklin circumnavigation trip, a 17Km paddle around the entire island. 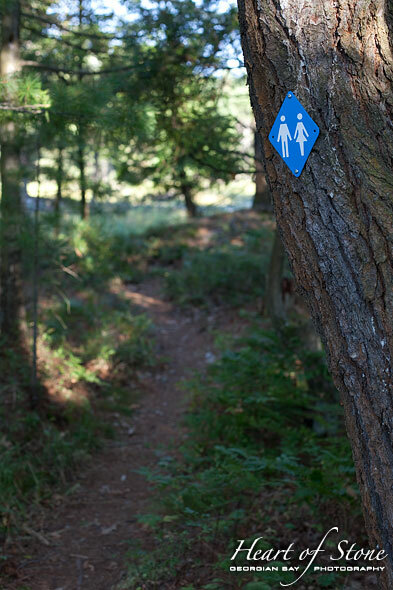 Pack a lunch, and hit the water for three or four hours. It’s a great first taste of distance paddling. 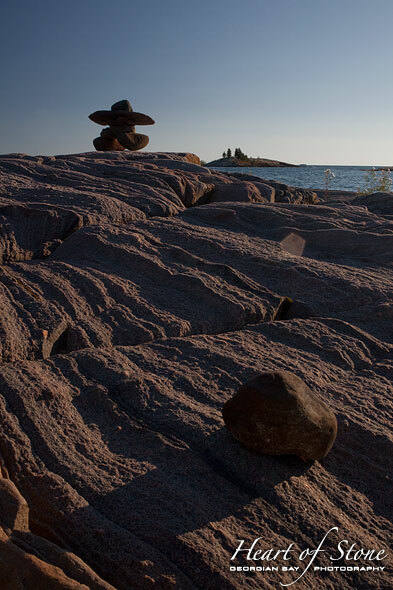 Above, left to right: a windswept pine bent over 90°, a relaxed cormorant, large architecture, and an inukshuk and granite formations. The western shoreline of Franklin is entirely wild, and the only boat traffic that you’ll encounter is of the paddled variety. There are some spectacular rock formations here, and I’ve been surprised both by bears and snakes. Make sure you hang your food at night. 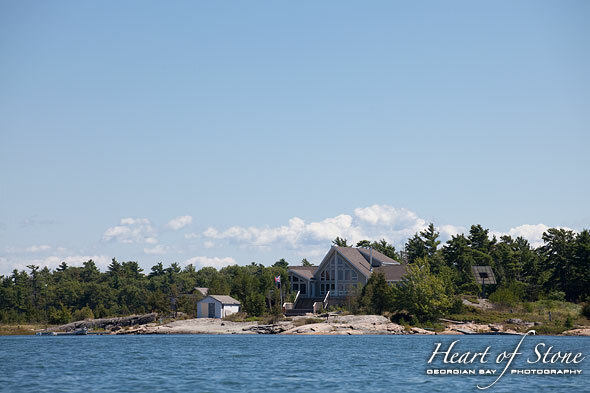 The north shore of the island and surrounding area is home to a few cottages, and the small-craft channel which runs all the way back to Snug Harbour and beyond. My charts were obviously hopelessly out of date, marked buoys have been added, moved, or removed altogether. A few ranges are now long gone, their white-painted bases all that remain. If you like to navigate by small-craft markers, make sure your charts are up to date. Down the east shore of Franklin, with its gently sloping rocky shores, the small-craft route meanders from one side of the channel to the other. Be aware of where you are in relation to it, boats power through here regularly. As you once again near Phoebe Point, the Snug Harbour lighthouse will come into view, and you’ll retrace your route paddling back to your campsite. 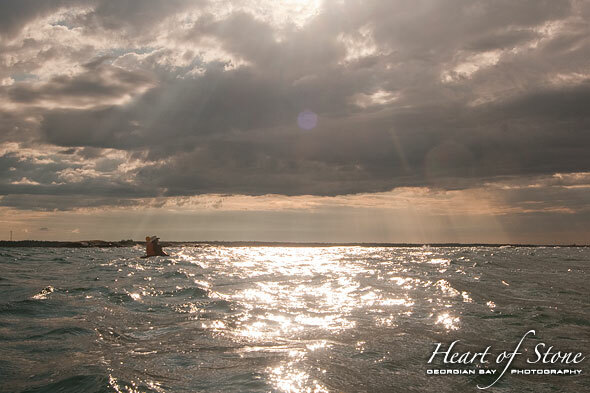 Here’s the thing about Georgian Bay: she can change her mind almost instantly. Calm weather can quickly transform into a squall, one day can be calm and the next day you can be windbound with 50Km/h winds and large breaking waves. Our final day turned out to be quite windy, and the flatwater paddling of the day before turned into a full-on roller coaster on the way out. The waves weren’t breaking, but when they’re big enough to obscure your paddling partners you know you’re in some decent water. 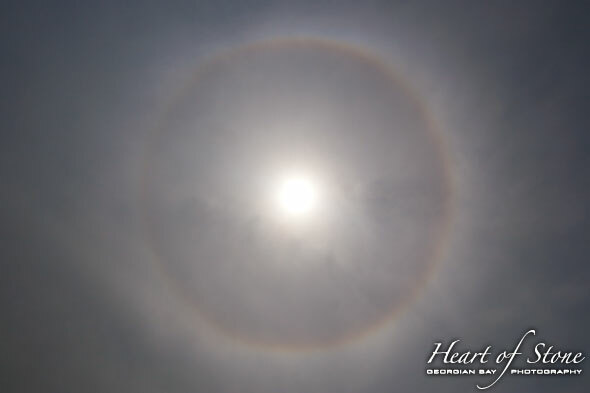 Above, left to right: a solar halo showing off ice crystals high in the atmosphere portends a change in the weather, and paddling out in some pretty awesome waves. Heading into this trip I purchased myself a new paddle, the joint in my old paddle’s carbon fibre shaft was completely worn out, and it was only a matter of time before it failed completely. Heading out through these waves I was thankful for the new gear. Breaking a paddle doing a high brace in these conditions would be unpleasant. Paddling towards the lee of a small island, I made a classic mistake and misjudged my timing, paying more attention to my paddling partner than to my own circumstances. A wave picked me up and dropped me onto a rock, snapping my rudder blade clean off. Beached on a rock, fully exposed to westerly building waves is not a great place to be. You have minimal control, no time or space to get out, and the next wave is imminent, ready to slap you fully broadside. Think fast. Preparing for the next hit I braced off the rock and pushed into the oncoming wave, using the temporary high water level to refloat the boat and slip off, powering through the funnel into the island’s lee. I was completely soaked, and contemplated dropping my cameras into their drybags for the rest of the paddle out. 1. Weather can change even the simplest of kayak trips. 2. Accidents are always a possibility, regardless of experience level. 3. Know how to paddle your boat without a rudder or skeg. They’re nice-to-haves, but you need to know that you can maintain full control without them, in any conditions that you might encounter. 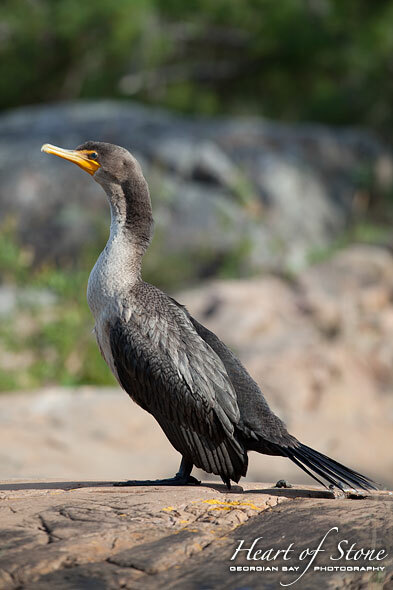 Paddling into the rising morning sun, my paddling partner appeared and disappeared, rising and falling with the large troughs and crests pushing in from the Bay. We rode the roller coaster all the way into Snug Harbour, surfing down the larger faces and heading for home. Franklin Island is the perfect first Georgian Bay kayak trip. A nice mix of wilderness, day trip possibilities, and proximity to the launch site with some fantastic camping make it a wonderful destination. But don’t be fooled, even though this trip gets a ‘novice’ rating, conditions can quickly notch that up to ‘expert’ and beyond. Check that long-term forecast before you go. The new paddle performed superbly, almost shocking in its solidity compared to the amount of play in my old paddle’s well-worn joint. Several thousand miles of paddling certainly takes its toll on gear. But now I would need a new rudder as well, an unforeseen circumstance for my battle-scarred boat. Oh well. As they say, out with the old, in with the new. All photographs © Copyright Sean Tamblyn, all rights reserved. This entry was posted on Monday, June 27th, 2011 at 9:35 pm. It is filed under Trip Reports. You can follow any responses to this entry through the RSS 2.0 feed.